Strasbourg (French pronunciation: [stʁaz.buʁ]; Lower Alsatian: Strossburi, [ˈʃd̥rɔːsb̥uri]; German:Straßburg, [ˈʃtʁaːsbʊɐ̯k]) is the capital and principal city of the Alsace region in eastern France and is the official seat of the European Parliament. Located close to the border with Germany, it is the capital of the Bas-Rhin département. The city and the region of Alsace were historically allemanic-speaking, which explains the city's Germanic name. In 2006, the city proper had 272,975 inhabitants and itsurban community 467,375 inhabitants. With 759,868 inhabitants in 2010, Strasbourg's metropolitan area(only the part of the metropolitan area on French territory) is the ninth largest in France. The transnationalEurodistrict Strasbourg-Ortenau had a population of 884,988 inhabitants in 2008. Strasbourg is the seat of several European institutions, such as the Council of Europe (with itsEuropean Court of Human Rights, its European Directorate for the Quality of Medicines and its European Audiovisual Observatory) and the Eurocorps, as well as the European Parliament and the European Ombudsman of the European Union. The city is also the seat of the Central Commission for Navigation on the Rhine and the International Institute of Human Rights. Strasbourg's historic city centre, the Grande Île (Grand Island), was classified a World Heritage site byUNESCO in 1988, the first time such an honour was placed on an entire city centre. Strasbourg is immersed in the Franco-German culture and although violently disputed throughout history, has been a bridge of unity between France and Germany for centuries, especially through the University of Strasbourg, currently the second largest in France, and the coexistence of Catholic and Protestantculture. The largest Islamic place of worship in France, the Strasbourg Grand Mosque, was inaugurated by French Interior Minister Manuel Valls on 27 September 2012. Economically, Strasbourg is an important centre of manufacturing and engineering, as well as a hub of road, rail, and river transportation. The port of Strasbourg is the second largest on the Rhine afterDuisburg, Germany. In terms of city ranking for innovation, Strasbourg has been ranked the third city in France and 18th globally. below the current Église Saint-Étienne in 1948 and 1956 unearthed the apse of a church dating back to the late fourth or early fifth century, considered to be the oldest church in Alsace. It is supposed that this was the first seat of the Roman Catholic Diocese of Strasbourg. Strasbourg is on the eastern border of France, on the Ill River where it flows into the Rhine on the border with Germany, across from the German town Kehl. The city lies in the Upper Rhine Plain, a major axis of north-south travel, approximately 20 km (12 mi) east of the Vosges Mountains and 25 km (16 mi) west of the Black Forest. Strasbourg's climate is classified as Oceanic (Köppen climate classification Cfb), with warm, relatively sunny summers and cold, overcast winters. Precipitation is elevated from mid-spring to the end of summer, but remains largely constant throughout the year, totaling 631.4 mm (24.9 in) annually. On average, snow falls 30 days per year. While it may be possible to find people who will engage in a conversation with you inGerman, the lingua franca of Strasbourg (and all of Alsace) is French. It is possible to hear German spoken on the streets, especially around the Cathedral. Alsatian (the historic Germanic language of Alsace) is a declining language, spoken mostly by the region's older residents or in rural areas but efforts are underway to revive it. Strasbourg has its own airport, serving major domestic destinations as well as international destinations in Europe andnorthern Africa. Train services operate from Gare de Strasbourg eastward to Offenburg and Karlsruhe in Germany, westward to Metz and Paris, and southward to Basel. Strasbourg's links with the rest of France have improved due to its recent connection to the TGV network, with the first phase of the TGV Est (Paris–Strasbourg) in 2007, the TGV Rhin-Rhône (Strasbourg-Lyon) in 2012, and the second phase of the TGV Est (currently planned to open in 2016). City transportation in Strasbourg is served by a futurist-looking tram system that has been operated since 1994 by the regional transit company Compagnie des Transports Strasbourgeois and as of 2010 consists of 6 lines (A, B, C, D, E and F) adding up to a total of 55.8 km (34.7 mi). A former tram system, partly following different routes, had been operating since 1878 but was ultimately dismantled in 1960. The tram system that now criss-crosses the historic city centre complements walking and biking in it. The centre has been transformed into a pedestrian priority zone that enables and invites walking and biking by making these active modes of transport comfortable, safe and enjoyable. These attributes are accomplished by applying the principle of"filtered permeability" to the existing irregular network of streets. It means that the network adaptations favour active transportation and, selectively, "filter out" the car by reducing the number of streets that run through the centre. While certain streets are discontinuous for cars, they connect to a network of pedestrian and bike paths which permeate the entire centre. In addition, these paths go through public squares and open spaces increasing the enjoyment of the trip (see drawing). This logic of filtering a mode of transport is fully expressed in a comprehensive model for laying out neighbourhoods and districts – the Fused Grid Being a city next to the Rhine and along some of its most important canals (Marne-Rhine Canal, Grand Canal d'Alsace), while crossed by the Ill, Strasbourg has always been an important centre of fluvial navigation, as is attested by archeological findings as well as the important activity of the ''Port autonome de Strasbourg. Water tourism inside the city proper attracts hundreds of thousands of tourists yearly. With more than 500 km (311 mi) of bicycle paths, biking in the city is convenient. Compagnie des Transports Strasbourgeois operates a cheap bike-sharingscheme named Vélhop'. The Orchestre philharmonique de Strasbourg, founded in 1855, one of the oldest symphonic orchestras in western Europe. Petite France (La Petite France): a canal flowing section of the wood framing around the building are very symbolic. Blick hepyu square (La Place de la République): Germany Period (1871-1918 ) played a central role in the plaza made. Lighting installation for the cathedral : the darkness falls , Notre Dame (Notre-Dame) vs. Cathedral reopens with lights and music . Summer concert : a large image of Strasbourg every night , light and laser show and music unfolds a variety of harmony . 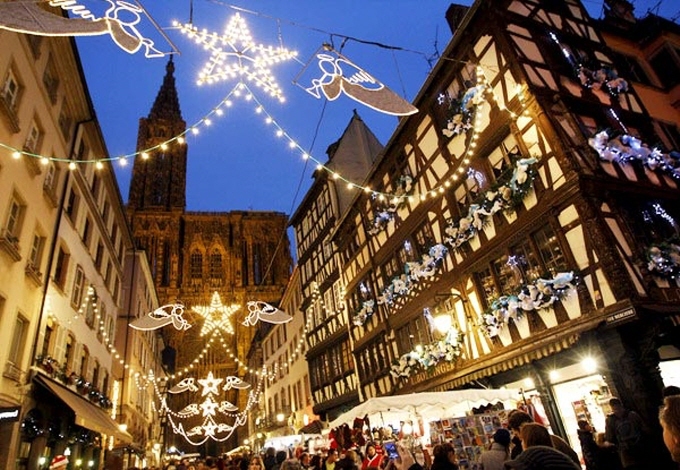 Strasbourg Christmas market every year since 1570 to open. The main events of the Christmas season is a beautiful and colorful. Explore the city with a professional guide in a tour around the city's main landmarks and tourist attractions see : the cathedral , the old town , alleys , streets , etc. City tours throughout the year to offer a variety of themes . Starting position (minimum 5 persons ): Tourist Information Office (Office de Tourisme), 17, place de la Cathédrale. Time: 1 hour 30 minutes 1h30 environ. Historic sites and Petite France (Petite France), Vauban (Vauban) Dam , for passing the cathedral and the route of the main tourist attractions . Announcement in various languages ​​ready . Strasbourg in France is one of the largest bike paths provided. Length of 500 km of bike paths , and parks and gardens is passed , the composition along the canal in the heart of the historic downtown area , as well as to enjoy the natural environment can be . Bicycle and roller skates are many places where you can rent a room.